I had some dead spooky photos to accompany this post, but since completing this walk (and a couple of others) my camera has disappeared, no doubt lying in some far flung part of the county. Ah well, it was nearly nine years old, so an excuse to buy another. The photos that do appear are therefore culled from the Bury St Edmunds museum website. When we first moved to Bury St Edmunds back in 1987 we visited Moyses Hall museum, on the market square, to get a bit of a feel for the place. 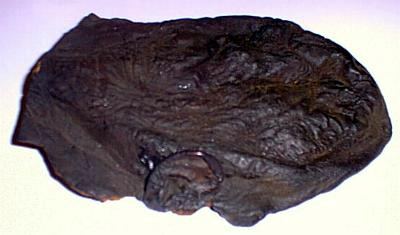 Amongst all the exhibits that one might expect of a pleasant rural market town – references to its abbey, mediaeval heritage, bronze age pots and axe heads and so-on, I was drawn to one particularly macabre exhibit – the death mask of William Corder, his features still distorted and engorged by his death at the hangman’s noose. And that was not all. 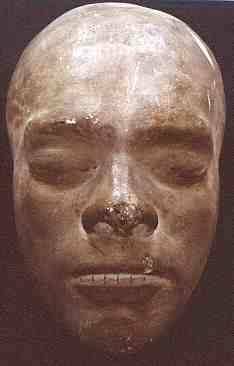 Accompanying this disturbing effigy was his preserved scalp (complete with one ear) and an account of his trial, bound with his tanned skin. A criminal of some notoriety you might surmise, and you would be right, for this was the murderer of Maria Marten at the Red Barn. Needless to say over subsequent years visiting nieces and nephews were treated to a visit to Moyses Hall as the highlight of my greatly embellished and ghoulish account of the crime and punishment. Kids love this sort of thing, and they gleefully related their experiences of a day out with uncle Phil & auntie Tini to appalled parents. As a result we were seldom given charge of our siblings’ children a second time. And yet we have never, until now, visited the site of this very Suffolk murder, and a bright sunny autumn day seemed ripe for a visit to the pretty village of Polstead. Set in rolling countryside, with half-timbered houses, a huge duck pond and secluded from the hurly burly of the outside world, Polstead today betrays no clue as to its notoriety in 1828. There is a lay by beside the village pond from where it is just a few short steps to the churchyard where Maria Marten is buried. There is no visible trace of her grave for the casual visitor, as it was plundered by souvenir hunters, but on a wooden out building a simple sign states that her final resting place is nearby. 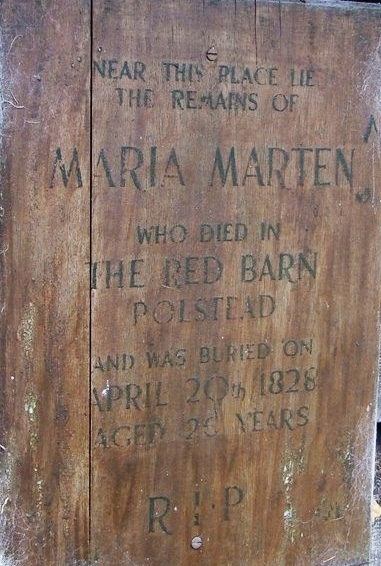 Maria Marten was the daughter of the village molecatcher. An attractive, sociable girl, by the age of 24, she already had two children as a result of her liaisons with the local gentry.The story is full of intrigue. Corder was, by all accounts, a shifty and dishonest character – thief, fraudster and womaniser. She was due to elope with Corder, and they met at the Red Barn (she dressed as a man) where Corder shot her and hid the body. There it would have remained but for her stepmother (herself a young woman, barely a year older than Maria) having dreams that Maria was buried in the barn. After nagging her husband for some weeks, he went to the barn and probing with his mole spud, discovered the body. By this time William had left Polstead and married. It has been suggested that the stepmother was having an affair with him and Maria was getting in the way. The wicked stepmother therefore plotted with William to get rid of her. True or not, it does seem odd that the stepmother’s ‘dreams’ only began after she heard of William’s marriage! The full story is there for you to read and judge for yourself on Wikipedia and the Bury St Edmunds town site. It’s worth the reading if you don’t know the story – and adds colour to the play if you ever get a chance to see it. And indeed it added to the atmosphere of the walk. The countryside offers a pleasant bucolic ramble on the borders of ‘Constable Country’ but with shady secret ways too through dappled sunlight and dark trees. 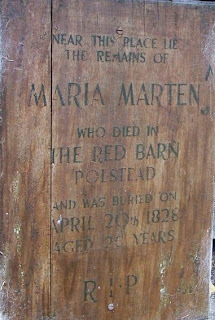 The way past the site of the old Red Barn leads down to a small valley where scratched on the door to an abandoned enclosure were the words "Maria Marten RIP," the only explicit reference that we saw in Polstead. The village now seems to quietly discourage the curious souvenir hunter and ghoulish day tripper, to allow Maria to rest in peace at last. And Polstead has returned to being just another picturesque backwater deep in rural Suffolk. Like many others, it keeps its secrets to itself. Has Lord Elpus been bolstering the life insurance? Is this just an arcane clue to the missing whereabouts of his good lady? Your public demand to see a picture of Miss W with today's paper or else the rozzers will be called in! Oh. I didn't buy a paper today. I do have a photo of Miss W listening to today's news on the radio - will that do? I must now visit. here. I have done said play twice, once as. goody and once as a rather badly. Nuff said. Maybe not in the Red Barn ... but didn't the Bottisham Players stage 'West Side Story' a while ago? Yes, but I am not one of them. I did do Brassed Off with Cottenham 1½ years ago, but I was involved in two groups. Radsoc, and Combined Actors in Cambridge. I did Maria Marten with radsoc, and I was a BAD Person!